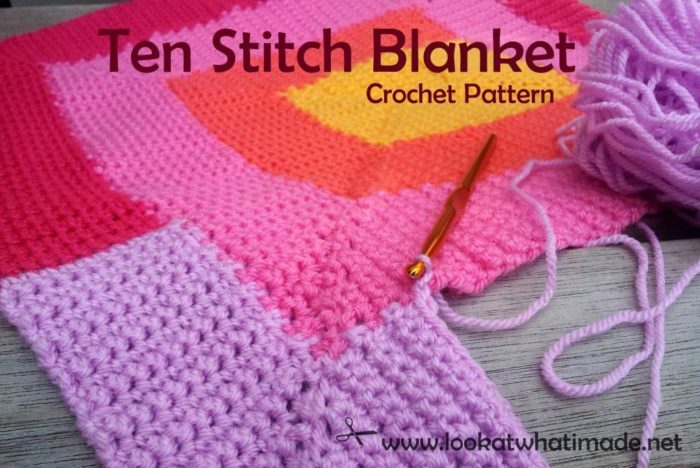 This Ten Stitch Blanket Crochet Pattern is a conversion of Frankie Brown’s Ten Stitch Blanket Knitting Pattern. I think everyone who knits has heard or seen one of these blankets. They are ridiculously popular and quite addictive. I find myself sitting there going: “just one more row, just one more row” and an hour later my husband stumbles into the living-room all bleary-eyed wanting to know if I am ever coming to bed. I would like to thank Frankie for giving me permission to write the crochet version of her lovely blanket. This pattern is FREE, but if you would like to show your appreciation for Frankie and her designs, you are more than welcome to make a donation to the Children’s Liver Disease Foundation through Frankie’s Just Giving Page. The Ten Stitch Blanket is worked in a spiral (or “rounds of rows”) around a central square of 10 stitches by 10 rows. The beauty of the project is that the short rows (10 stitches per row, less on the corner rows) propel you forward like you wouldn’t believe and it is the perfect pattern for using up any and every scrap of yarn in your house. Because you are slip stitching into the rows of each previous “round of rows”, you will notice a little interlocking pattern along each “seam” (on the front of the blanket). On the back of the blanket the seam will be more prominent. © Dedri Uys 2013. All Rights Reserved. This pattern was tested by: Korinne Wiese, Venetia Smith, Pam Perkins, Beth Spaulding and Phyllis Haygood. If you would like to print this pattern, please use the print-friendly button at the bottom of this post, which will allow you to print/save the post. You will also have the option to remove unwanted images. Yarn and hook of your choice – but make sure you use the same yarn and hook for the whole blanket. Gauge is not important as such, but if you are going to use different thicknesses of yarn, you will need to work up your own gauge square and then adjust your hook accordingly when you swap yarn thicknesses. If you do not do this, you’re going to end up with one wonky-looking blanket. At the bottom of the post you will find Printable Reference Cards for the Ten Stitch Blanket Crochet Pattern. These cards DO NOT contain the whole written-out pattern. They contain instructions for each of the sections in a handy cut-outable format so that you can print them, cut them out and laminate them for quick reference. I’ve left a little space where you can note down the hook and yarn you are using. I got this idea from my friend Beth, who said that she likes having patterns on laminated cards so that she can use them on the go without ruining them. 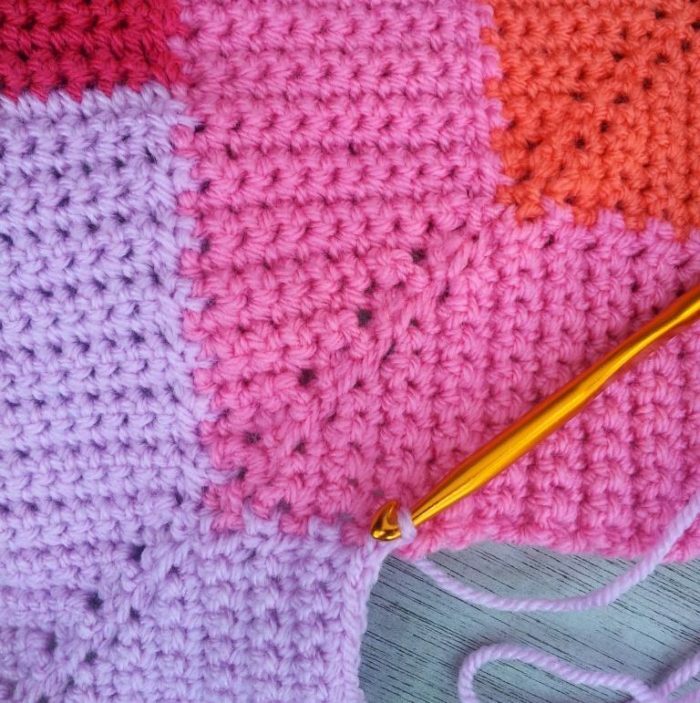 If you are using scraps of yarn for this Ten Stitch Blanket, it is a good idea to work over your yarn ends as you add each new colour. That way you won’t have a million tails of yarn to work away at the end. 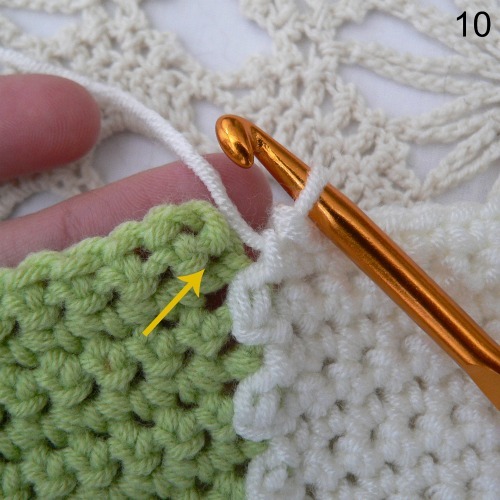 If you are not familiar with working over your yarn ends, here is a very clear tutorial by CrochetGuru. The best place to change colours is on the outside edge of one of the middle sections, so at the end of one of the rows that end in a ch-1. The worst place to change colour is right on the sl st edge. Don’t do it! Now that that’s done, let’s get started. I have broken the instructions for the Ten Stitch Blanket into 4 Sections: The First Square, The Ending Corners, The Beginning Corners and The Middle Sections. Below this pattern diagram, you will find instructions and photos for how to work each of these sections. If you get stuck with the pattern, please refer back to this diagram to see which section you should be working next! Please remember my warning about not changing yarn thickness/hook size halfway through the blanket (unless you make very sure that the gauge will match what you have been doing up to that point). Foundation Chain: Ch 11. This foundation chain does not count as a row and you will work OVER it when the time comes. Now work an Ending Corner as instructed below. You have now made half of your corner. To complete the corner, and change the direction of your work by 90 degrees, make a Beginning Corner as instructed below. You will need to do this after EVERY Ending Corner, otherwise your corners will be incomplete. You have successfully completed one corner and changed the direction of your work by 90 degrees. You will now need to change it by 90 degrees again so that you are able to work into the side of the First Square. 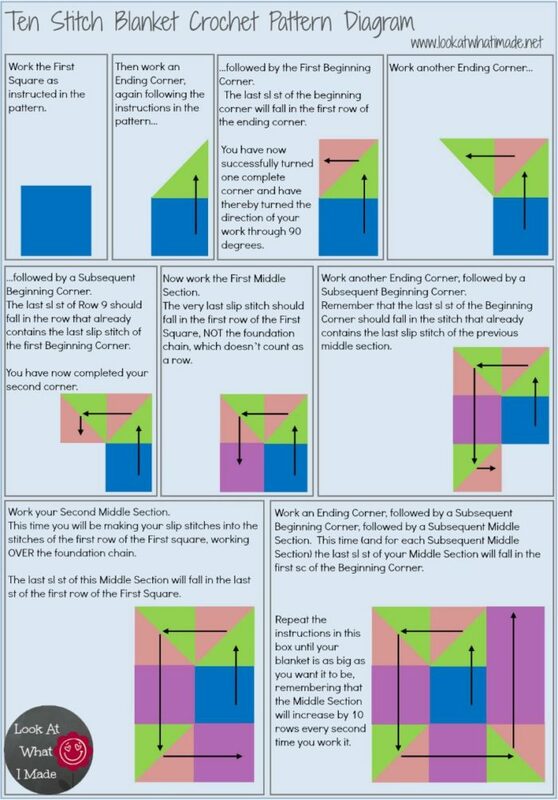 So when you have completed the First Beginning Corner, make another Ending Corner and then a Subsequent Beginning Corner (instructions below). These corners are exactly the same as the First Beginning Corner, but the sl st at the end of Row 9 will fall in a row that already contains a sl st. When you have completed your Subsequent Beginning Corner, make a Middle Section as instructed below. From this point onwards each Beginning Corner will be followed by a Middle Section. Sc in the next 10 st’s. Sl st in the next row. This will be the first row of the First Square, NOT the foundation chain (see Photo 10). The foundation chain doesn’t count as a row and you will work over it to minimise the formation of holes. Ch 1 and turn. Now work another Ending Corner (as instructed above). 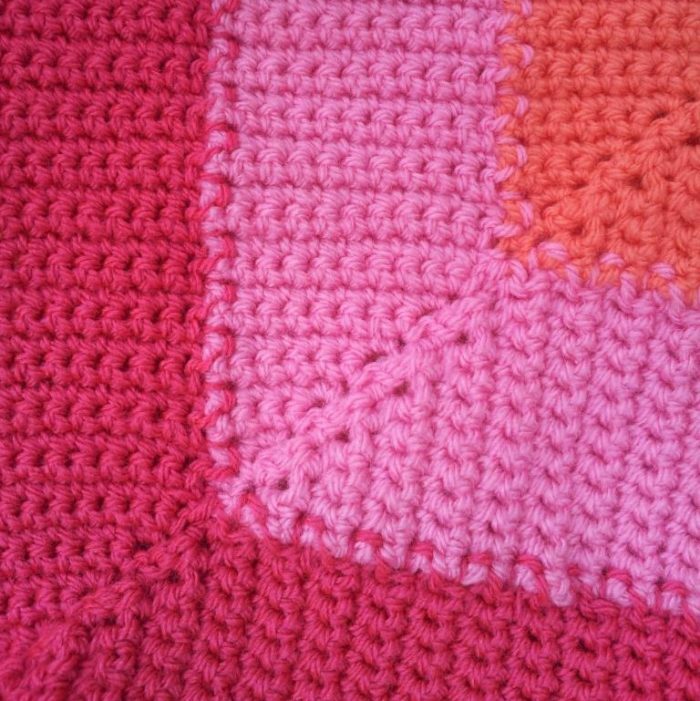 For the second Middle Section you will be making your slip stitches into the stitches of the first row of the First Square (working over the foundation chain). Sc in the next 10 st’s. Sl st in the last stitch of the first row of the First Square. Ch 1 and turn. Now work another Ending Corner. Sc in the next 10 st’s. Sl st in the first sc of the Beginning Corner of the previous “round of rows” (see Photos 11, 12 and 13). Ch 1 and turn. Continue working an Ending Corner, a Subsequent Beginning Corner and a Subsequent Middle Section (which will increase by 10 rows every second time you work it) until your blanket is as big as you want it to be. By the time you have worked all the sections illustrated in the diagram at the start of this post, you should be able to do this pattern backwards in your sleep. Around this time you will also notice that it is becoming a drag to turn the whole thing over every 10 seconds. This can be easily remedied. Simply flick your work back and forth between rows like the pages in a book instead of turning it around in the traditional way. Please note, though, that this will “hide” the last stitch (the stitch next to the slip stitch edge) a little bit, making it easy to miss and subsequently skip. So if you are going to take the path of least resistance with the turning, make sure that you don’t start skipping stitches when you shouldn’t be. You will notice that the corners won’t be exactly square. In fact, they will look rounded and a bit “curly”. This will correct itself when you work the next “round of rows” into them and they should self block. Even so, you might need to give your work a bit of a tug every now and then and you should definitely block the finished blanket. Like I have already mentioned, you might want to make this blanket as a gap-filler between other projects. If you are concerned that you might forget how to work the sections the next time you pick the blanket up, please feel free to print and laminate these reference cards. Remember to note down the hook and/or yarn you will be using for your blanket. 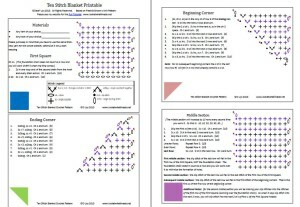 These cards are NOT the completed pattern, only the basic instructions for each section. If you get stuck using them, please refer back to the instructions and diagram above. I hope you love working on this Ten Stitch Blanket. If you have any questions or suggestions, please do not hesitate to leave me a comment. And I love, love, LOVE seeing your completed (or even in-progress) projects. To brag about your blanket, add a Ravelry Project to the pattern or share a photo on the Lookatwhatimade Facebook timeline. Oops! My instructions in the previous comment were less than accurate — not used to writing “how-to” stuff. After making the ring and doing the first round of the square corner, the next round should be sc, (sc, ch2, sc) in ring, sc. For the rectangle, it should be sc, (sc, ch2, sc) in ch2 space, 2sc, (sc, ch2, sc) in ch2 space, sc. By doing a sc in every sc of the previous row and a ch2 in the previous ch2 space, the number of stitches in each round increases. Hope that’s clearer. 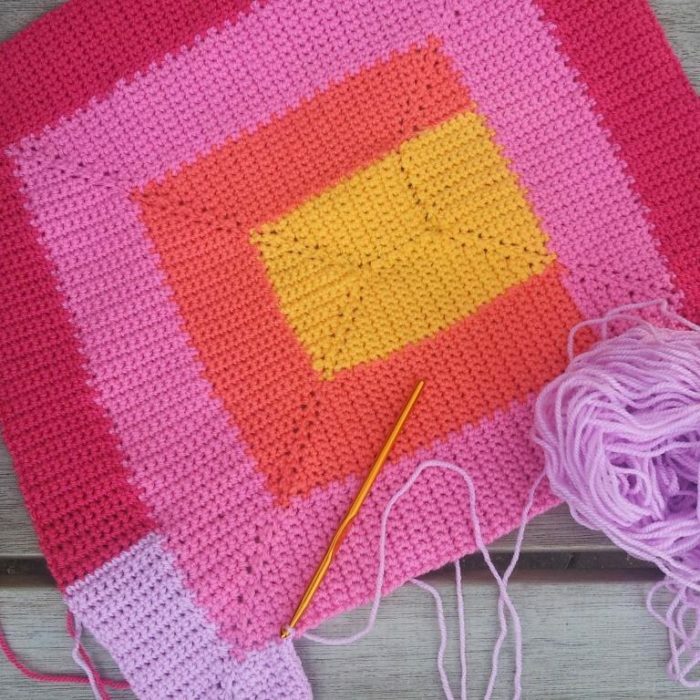 I absolutely love the look of Frankie’s 10-stitch corner blanket (https://www.ravelry.com/patterns/library/ten-stitch-corner) but had problems with the corners, both single and reverse double. So I was delighted to find this crochet version of the regular 10-stitch blanket. I still couldn’t get the short-row corners to look good. So I figured out an alternate method for the crochet corners: Where the corner starts, I made a 3-chain ring and worked a (sc, ch2, sc) in it, then attached it to the last section with a slip stitch, turn, and worked (2sc, ch2, 2sc, ch1, turn), repeating the increases in the ring on each row for 10 rows. For the reverse double corner, I made a 4-ch ring, then worked (sc, ch2, 2sc, ch2, sc) in the ring, sl join in last section, turn, (2sc, ch2, 4sc, ch2, 2sc), ch1, turn. etc., for 10 rows, forming a mitred rectangle. So for each corner, one half of the square or rectangle is attached to the previous section(s) and the other is not attached. The last row must end at the “free” side so you can turn and begin the next section. I’m sure this sounds very confusing, but once I worked out the method, I found it much easier. Maybe someone else will also!